Watch footage from the Terminal 5 show now. 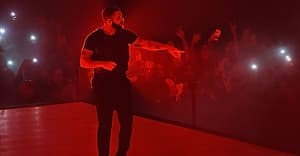 Drake played a show an Adult Swim party in New York on Wednesday night, May 17. He appeared at Terminal 5 to celebrate the network's upfront week announcements. During the show he brought out special guests Migos, who performed “Bad and Boujee” and “T-Shirt,” plus Playboi Carti (who did “woke up like this*”). Clips from the night can be seen below.